In the historical part of Saint-Petersburg, on Turgenev square, there is a wonderful place where you will always be warmly welcomed by the staff of the restaurant «Dva Mu». 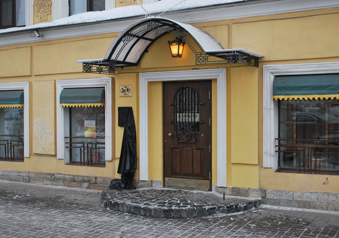 The brand of the restaurant is the main characters of the story Turgenev – Gerasim and Mumu. Amazing mood is created when you enter to the restaurant when you see the monument of the faithful dog, curled up in a ball waiting for the owner at his boots. And, of course, in the service and in elaborate cuisine for every taste, created by a team of creative chefs. If you order any dish costing 350 rubbles and more, we offer you 1 shot of vodka for free…. there is a possibility to take meals to go. Restaurant consists of two cozy rooms for 70 seats and a bar. We are available for business lunches, banquets, weddings and table reservations.. The restaurant is ready to accept and serve at the highest level tourist groups (discounts are possible). Accept payment by cards VISA, MASTERCARD, MAESTRO. Discount cards for regular visitors. Exhibitions and sales of works by professional artists and photographers. The restaurant is open from 10.00 to 23.00.